Our dedication is to quality. We use only pure essential oils and other ingredients from the plant kingdom making our all natural, vegan, herbal soap products some of the best found anywhere. 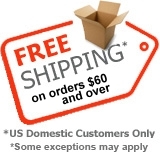 Free shipping on orders over $60 in the US ONLY. Does not apply to International orders. Natural, vegan, herbal soaps, aromatherapy bath, body, and massage oils, lotions, and other natural skin care products made by hand in north Georgia, at Greenstone Soap Company. Gift sets available. 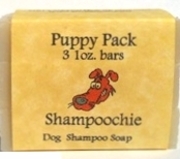 Shampoochie® All Natural Herbal Dog Shampoo Soap is a 100% biodegradable, all natural herbal shampoo soap for your dog. This specially blended shampoo bar for dogs is made with Shampoo and conditioner in one! • 8 Natural plant oils to condition skin and fur. • 5 pure essential oils to soothe itchy bites. • Sulfate Free … Chemical Free. • Leaves your pet’s coat soft, silky and smelling great. • Non-detergent based so will not destroy Frontline or Advantage. • Planet Safe and Kid Safe! Leaves your dog’s coat soft and silky smooth, with a natural fresh herbal scent. (Approx. 3.5 oz) Safe for cats, too. 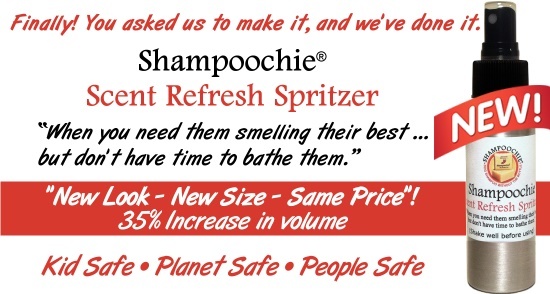 When you need them smelling their best … but don’t have time to bathe them, Shampoochie® Scent Refresh Spritzer to the rescue. 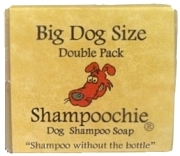 All natural dog shampoo, great for all dogs, especially those with dry itchy skin. Made with our proprietary blend of pure essential oils, Shampoochie® all natural dog shampoo leaves your pets coat soft and silky smooth, with a natural, fresh herbal scent. Copyright © 1999-2019. Greenstone Soap Company. All Rights Reserved. Natural, handmade, vegan, herbal soaps and skin care products, from Greenstone Soap. 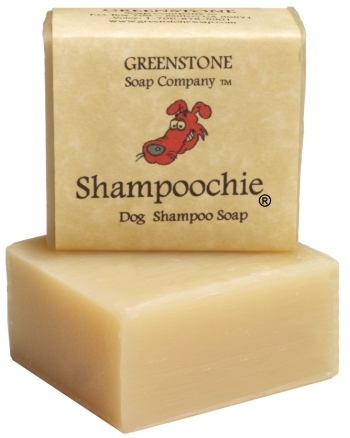 Organic Vegan Shampoochie dog shampoo soap, aromatherapy, lotions, essential oils, in Sautee, near Helen, Georgia.